SDDD -- How are you? - San Diego Dining Dish! SDDD -- How are you? What have I been up to lately? I've actually been pretty busy! I've not been doing a lot of restaurant reviews, because except for an amazing meal at Cafe Chloe for Restaurant Week, I've been doing a ton of cooking! My daughter has a very early bedtime these days -- she goes down around 6:30 - 7 pm. We could go out, and perhaps she would sleep through the meal....but then she's completely thrown off for the rest of the night. She sleeps through the night now, and has for at least a month now. I don't want to mess up a good thing! So we cook and eat at home, a lot. It's actually been very, very enjoyable! I've made tons of soups with homemade stock, spaghetti and meatballs, pastas, and lots of curry! I've always wanted to make more curry dishes, and I think that I've cracked the code by using my crockpot. 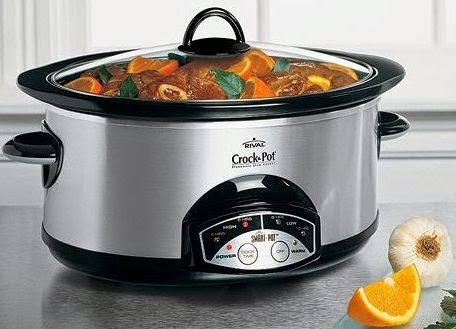 It's so easy -- pour in the ingredients, turn on the crockpot, and when Steve gets home, we have a delicious curry awaiting us after putting the baby to bed. Otherwise, I'm pretty sad that Denny's didn't do a Hobbit-themed menu this year for the final movie. The last two years were so fun, and I was really looking forward to the conclusion -- The Battle of Five Armies -- In My Gut. Ah, well. In other news: my daughter will start eating solid foods soon! We have been slowly giving her rice cereal, but I'm excited to cook for her, and really hope that I'm able to make her baby food. If she's anything like her parents, she'll be a good eater!